Rain is tangible. Very wet leotards clinging to sodden thighs is tangible. I feel as though I am about to write a Gothic novella or something; but then I realized that I used the word "leotard." Nobody uses that word anymore, unless you're a member of the National Ballet and even then maybe not. So yesterday's tangible was rain. Actually it was only the merest drizzle when we started out for our walk and we decided that we could be in Scotland, where this type of day happens almost daily and that we should just get over it and keep walking. We didn't take umbrellas because I broke our last $3.00 umbrella on Wednesday when it wouldn't open. I really hate umbrellas anyway, even when they do work. They take up a hand and you still get fairly wet, if you're walking for an hour or so anyway. Well no sooner had we made our resolve to walk in spite of the weather, when it poured. I gave up - came home, changed - whimped out again!! So now what? Earlier in the day I had re-acquainted myself with housework. It wasn't really a chore because I was using it as an escape from working on my new Wordpress site and given yesterday's WP experience, I was pulling out all the stops - anything was worth doing, if it took time away from WP. I even went to Ikea - on a Saturday!!! My excuse was to buy fitted sheets, on their own not part of a package - 2 sheets - 2 pillow cases. Well, I found a few, but even Ikea has started "bundling" their linens - all the more to sell you!! Actually, Ikea was in full buying mode - tantamount to feeding frenzies in the animal kingdom. As maddening as it was, it was also a little sad. I realized that for most of these people, this was their weekend entertainment. Then I realized that mine was housework, walking in the rain and/or Wordpress. Time to get a life!!! We managed to salvage the end of the day by reading recipes for pot roast (I know - this is a redemption?) which we will make today and cooking up a mess of pasta with fresh clams, which we ate with relish (enthusiasm - not the pickle kind) last night!! And...and... wait for it, I installed the WPEC (Wordpress ecommerce) plugin on my WP template. A terrific end to a fair to middling day!! Today is a "U" day. I would like to channel - can I say that? "Unique," "Urbane," "Unfettered." 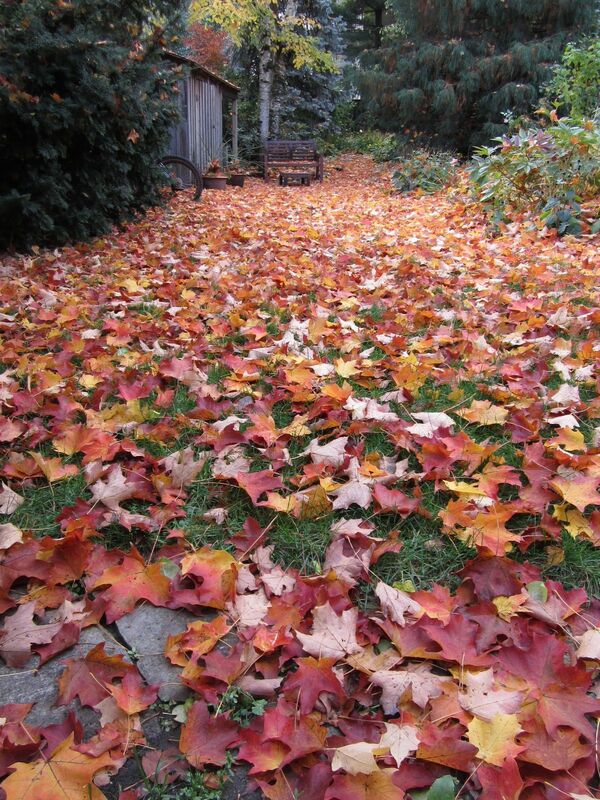 Above is my equivalent of (tantamount to) a bed of roses - sheets of maple leaves - "unbundled" - free for the asking. I almost hate to rake them. Have an Über day - with or without the umlaut !! !